Lakme Sun Expert Sun Protection Fairness UV Lotion SPF 24 PA++, SPF 30 PA+, SPF 30 PA++, SPF 50 PA+++, Skin Lightening After Sun Gel, Skin Lightening After Sun Mask, Skin Lightening After Sun Face Wash.
Protection against UVA and UVB Rays. Stops Tanning, Sun spots, Skin Darkening, Pigmentation, Sun burns, Ageing & Lightens Skin. Free Shipping Worldwide.Ships usually within 2 days. Don't you just hate it when your skin gets darker every time you step out in the sun? The longer you stay out, the darker you get. And by day end, you look a couple of shades darker than you did before you left your house.This is because your skin contains a pigment called melanin. Now the sun's harmful rays trigger melanin production, making you tan instantly. This means that a tan is the first sign of sun damage. And if you don't get the correct protection, it even leads to sun spots and wrinkles. So how do you stop the sun from wrecking your skin? Simple. 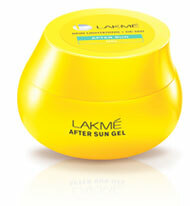 Use the new Lakme Sun Expert Anti Darkening Sunscreens. 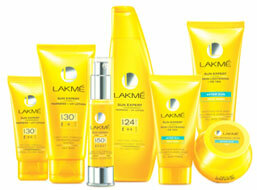 Know what's new in the new range of Lakme Sunscreens. Lakme sunscreens now come with two new powerful ingredients - Titanium Dioxide and Avobenzone, which block the UVA rays that cause skin darkening. 97% Protection: These new sunscreens are broad spectrum sunscreens. This means that they protect your skin from both UVA and UVB rays, giving you 97% protection from the sun. Goodness of Chamomile and Marigold: Chamomile extracts contain anti-inflammatory properties that calms irritated skin, while marigold moisturises and brightens skin, leaving you with beautiful and radiant skin, no matter how harsh the sun. Water & Sweet Resistant Formula: Can be used while swimming and while carrying out your daily activities. The new sunscreens have a unique 2 way action that not only stops tanning, sun spots and ageing, but also lightens your skin by regulating its skin darkening pigments. 30ml : $19.95 X Nos. 60ml (2 x 30ml) : $34.95 X Nos. 120ml (4 x 30 ml) : $63.95 X Nos. 100ml : $17.45 X Nos. 200ml (2 x 100ml) : $30.45 X Nos. 400ml (4 x 100ml) : $53.45 X Nos. Best suited for normal to dry skin. 100ml : $17.95 X Nos. 200ml (2 x 100ml) : $31.45 X Nos. 400ml (4 x 100ml) : $55.45 X Nos. 200ml : $19.45 X Nos. 400ml (2 x 200ml) : $33.95 X Nos. 800ml (4 x 200ml) : $58.45 X Nos. 50g : $13.45 X Nos. 100g (2 x 50g) : $21.95 X Nos. 200g (4 x 50g) : $40.45 X Nos. Cleanses and soothes sun exposed skin. Infused with cucumber and lemon grass extracts that soothe and calm skin irritated by sun exposure. Use immediately after sun exposure for maximum benefit. 100g : $13.95 X Nos. 200g (2 x 100g) : $22.45 X nos.